14—GEAR Production Supplement vehicles, and motor boats." As you may have deduced, today that company is known simply as "ZF." A New Kind of SUV Having acquired U.S.-based automotive supplier TRW Automotive in May 2015, ZF has become the third-largest automotive supplier in the world, with 134,000 employees located in some 230 facilities across the globe. It started production in Brazil in 1958, the U.S. in 1979 and China in 1993. Overall, it now operates in some 40 countries. In 1965 it started producing multi- ratio transmissions for passenger cars—as in "automatic transmissions"—and 50 years later, it is a leader in the technology. In 2014, it had €30 billion in sales, of which it invested approximately fve percent in R&D. Which is all good. But what about the electrifcation of the vehicle? What is this going to do to a company that is literally based on gear manufacturing? So we go to a test facility outside of Potsdam to fnd out. 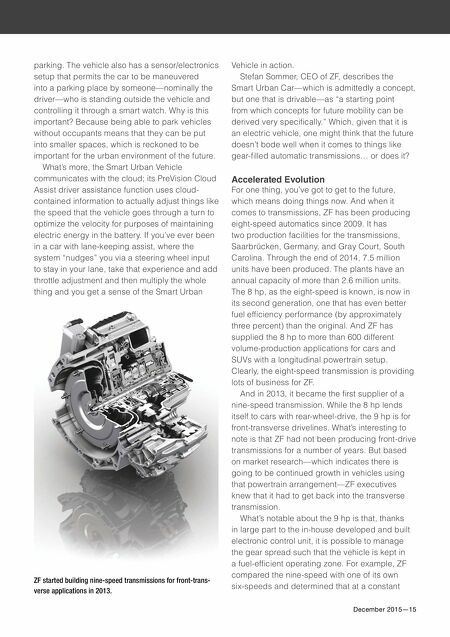 And there we discover a vehicle that ZF has engineered, the "Smart Urban Vehicle." It is a subcompact electric vehicle propelled by what's called the "eTB," or "electric Twist Beam," axle, with 40-kW motors on both the rear right and left wheels that provide axle torque of 1,400 Nm (1,033 lb-ft), 21,000 rpm, and a top speed of 150 km/h (93 mph). 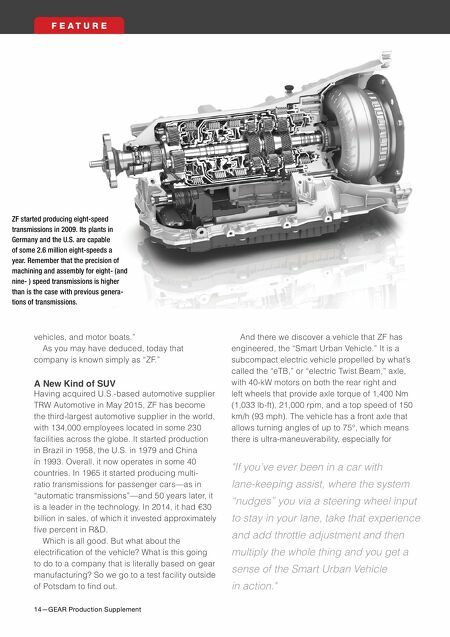 The vehicle has a front axle that allows turning angles of up to 75°, which means there is ultra-maneuverability, especially for ZF started producing eight-speed transmissions in 2009. Its plants in Germany and the U.S. are capable of some 2.6 million eight-speeds a year. Remember that the precision of machining and assembly for eight- (and nine- ) speed transmissions is higher than is the case with previous genera- tions of transmissions. F E A T U R E "If you've ever been in a car with lane-keeping assist, where the system "nudges" you via a steering wheel input to stay in your lane, take that experience and add throttle adjustment and then multiply the whole thing and you get a sense of the Smart Urban Vehicle in action."